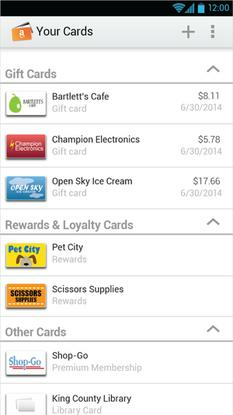 Amazon's Wallet app let users store and use various reward cards, and keep track of the balances. Amazon has pulled the plug on its Wallet app, a service the company launched in beta six months ago to dip its toes into the burgeoning area of mobile payments. Amazon is removing the Wallet app from the Amazon and Google Play app stores Wednesday, it said. People will still be able to use cards they added to the app but their balances will no longer be updated in the wallet, so they'll have to keep track some other way. "We've learned a great deal from the Amazon Wallet beta program and will look for ways to apply these lessons in the future as we continue to innovate on behalf of our customers," an Amazon spokesman said via email. Any future plans for the app, and Amazon's plans for mobile payments more broadly, are unclear. Still in beta, the app had limited functionality. It provided a vault for people's gift, loyalty and reward cards, but did not yet store debit or credit cards like Apple Pay or Google Wallet. Users scanned the cards into the app, and could then use their smartphone to make a purchase in physical stores or online. Mobile payments is an area of growing interest to technology companies, with Apple Pay the latest big service introduced. Companies are still trying to figure out the best way to let people make smartphone purchases. Google is reportedly in talks to buy mobile payments company Softcard to aid its efforts. Some retailers have signed on to one type of mobile payment service, but not others, adding to the challenges. Amazon's removal of its Wallet app illustrates the complexities in developing a service that works well for consumers. It might mean Amazon has something better up its sleeve, but we'll have to wait and see.